The team was again drawing on the valuable exerience gained through the development of its easy-to-use local business directory – Quoakle. So what’s special about Great Days Out? … It’s easy to find on Google and Bing! Our website is consistently on the top page of Google and Bing in the organic listings (left hand side of the page). Check this out by typing into Google the keyword phrase: “days out in the uk”. Using a memorable, exact match domain such as www.great-days-out.co.uk is going to help us to make sure the website stays in that position. … No reviews! … just quick access to the website of your choice! Lots of people are looking for reviews – so there are well known review websites. 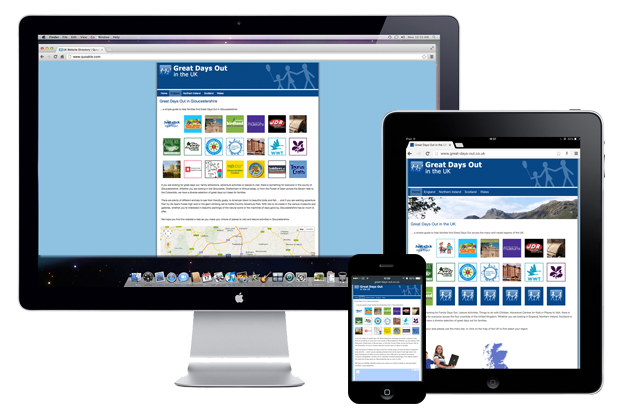 Other internet users would rather hear what the days out businesses themselves want to promote as their strengths – and that’s what Great Days Out wants to help its users to find out … quickly and easily. With just one click, our users can get straight to the days out businesses’ own websites – with all the most up-to-date information and contact details. Maybe you don’t mind banner ads, but our goal as Quoakle Directories is to “do what is says on the tin” and not distract users with all sorts of other things they’re not looking for. So for example, if someone is looking for Days out in Essex, then that is what we’ll present to them on our Great Days Out Essex page. As a small, family-run company with a friendly approach, we look forward to working with “Days Out” businesses across the UK. If you are interested in Great Days Out promoting your activity or attraction, then please click here to get in touch!